This week's Bread Baker's Apprentice Challenge is Peter Reinhart's recipe for Ciabatta Bread (which you can get from his book above, starting on page 135-142). I haven't always been a fan of ciabatta bread but after making it from scratch, I've definitely had a change of heart. 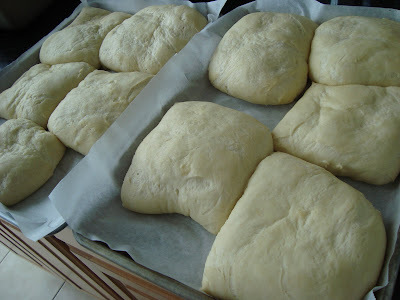 There were 2 pre-ferment options Peter Reinhart offered to make ciabatta bread - a poolish or biga version . There were also options to make a few variations using the same recipe including Wild Mushroom Focaccia, Ciabatta with Cheese, and Caramelized Onion and Herb Ciabatta. But being that this was my first time to make ciabatta from scratch, I chose to make it as plain and simple as possible using the poolish version. To start out, I needed to make a poolish, which is a yeast starter. Yeast, water and a little flour is combined and left to ferment for a few hours or overnight. This mixture is then added to more yeast, flour, salt, water and olive oil to make the bread dough. 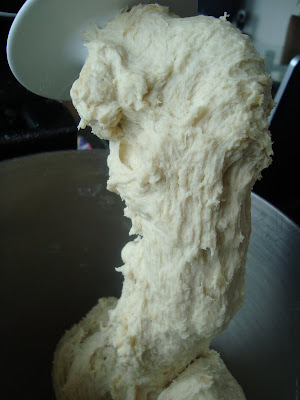 This takes a whirl in my stand mixer to combine and knead. 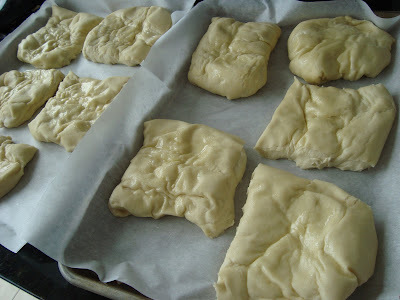 Once kneaded,the dough is formed into a couple of rectangles and then folded onto itself before it's first rise. This part is especially important to get the air holes and open crumb that ciabatta is known for. I'm pretty sure that this part takes some practice! 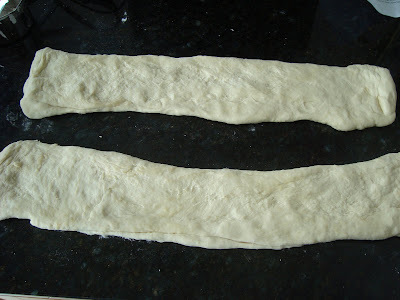 After it's first rise, the recipe calls for using a cloth to help shape the dough. I got a little intimidated by the next step so I decided to take an easier route but forming the dough into rolls instead of traditional loaves. So I cut the dough into 10 squares and let them rest for their second rise. Now that these guys had their second rise, it's time for the oven! 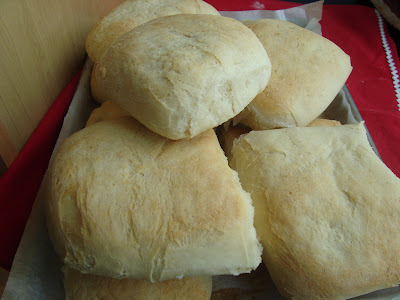 I baked my rolls until lightly golden and ended up with some great sandwich bread for the week! What a great idea! I love the rolls. Great job. You're one smart girlie making them into individual rolls. Perfect size for panini! Definitely doing this the next time I make this bread.